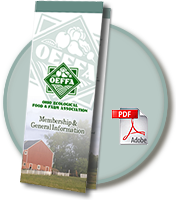 Please become a member of OEFFA and work with us to cultivate an agriculture system that nourishes our bodies, our communities, and our environment. Special members' pricing on products and discounted admission to events, including OEFFA's annual conference--Ohio's largest sustainable food and farm event. Learn more about how OEFFA is making a real difference for Ohio's local and organic food systems.